1. Peel & chop the chow chow discarding the seed. 2. In a kadai/wok heat oil, splutter the mustard seeds, curry leaves, red chilli, channa dal. 3. Add the chopped chow chow mix well. Sprinkle 1/3 cup water and cook covered for 5 minutes or until the chow chow change colour and are cooked well. 4. Now add salt, turmeric powder, cumin powder and mix well, cook covered for 2 minutes. Switch off. 1. Make sure the chow chow are cut into small cubes so that they cook faster. 3. I have not used onions for this stir fry you can go ahead and use if you like it. Quick and simple poriyal, i can happily have it with some rice. 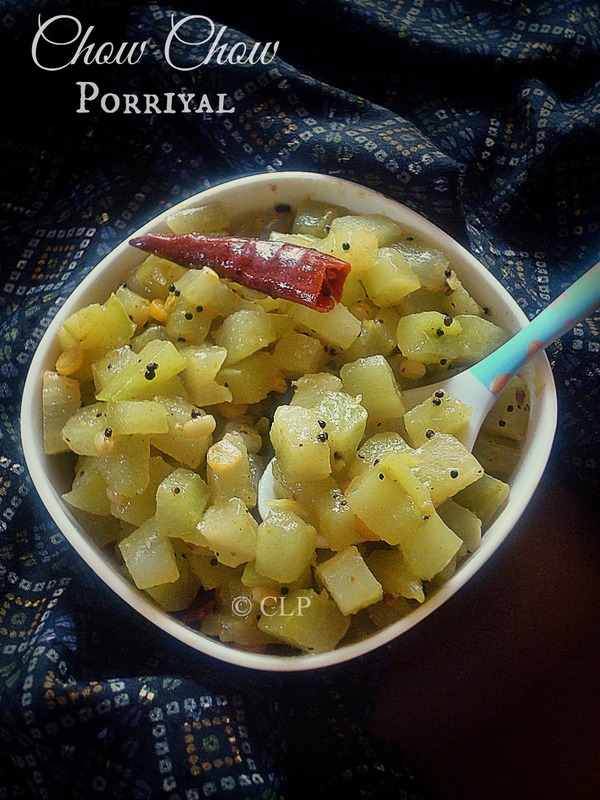 Delicious and healthy poriyal, perfect with rice and sambar.. This will be a new dish at my home.love the simple flavours!